Some amazing tips to use The Strong Energy Of Full Moon and enhance your good luck. These tips are applicable for 2 days before and after the period of Full Moon. This is the time the Moon energy is the strongest. 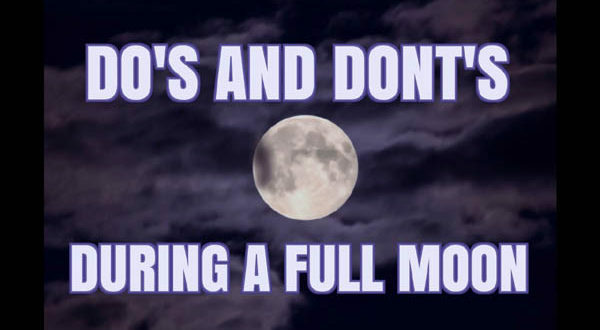 Full moon energy can be good for you only if you use it correctly. If you follow this do’s and don’t you will be able to increase the level of your positive energy. The Full moon can bring enormous energy and If you want to benefit then it is better you stay calm and relaxed. If you stay agitated then it won’t have any positive effects on you. You need to understand that everything that happens on your body, mind and soul will be enhanced during this period. If you are happy, you will be more happier, If you are mad, you will get even madder. If you are feeling sad, your sadness will only be enhanced. The Full Moon energy is very strong and you need to put is in the right direction. The following Tips (for two days before and two days after the full moon) will help you properly use its energy. Avoid arguments, quarrels and all kinds of discussion. Avoid getting angry even if things frustrate you. The full moon is the time to stay calm and find peace and let go of things on which you have no control. Take a deep breath and forgive those you bring you harm. The period of Full Moon is to put yourself into the positive frame of mind, so that positivity can multiply. Do things which are creative to get the best out of you. It may be preparing your favorite meal, painting or any other artwork, writing a story or poem or dance on your favorite tune. Remember that 10 – 15 minutes of positive thoughts is enough to get you going. You may recite Mantra, excess gratitude to God for everything that you have. You may even stand in front of the mirror and compliment yourself. Beautify your surroundings and appreciate what you have. The full moon period is a unique period to enhance your techniques and skills. Therefore no matter what your field is and what your goals are. This period you should use the flow of positive energy to learn something new. Write down your new ideas and pin them so you can work on them at a later date. Join a large group or do it alone, but Meditation during Full Moon really helps. It also helps to stay calm and peaceful and happy. Sharing what you have is the best during Full moon period. Radiate your good energy to those around you. Leave ego and jealousy as they bring negativity. Go forward and help those who are suffering. Bring people closer to you by showing your affection, love, and care. Give food and medicines to those who are hungry or ill.